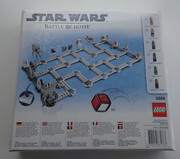 Vand set Lego 3866 Star Wars: The Battle of Hoth absolut nou sigilat, cutia arata impecabil in folie, editie de colectie care nu se mai gaseste in magazine, ideal pentru cadou la orice varsta, provine dintr-o colecte, mai am si alte seturi din seria Games, dar desigilate. According to the set database, this set has 305 parts. Defend Hoth™ as you battle against your friends and the Empire! Introducing LEGO® Games, the world’s first collection of games that you build, play and change. 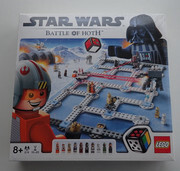 With the unique buildable LEGO Dice and changeable rules, the LEGO Games collection is a great way of having fun together with family and friends. It is a dark time for the Rebellion. Darth Vader has discovered Luke Skywalker’s secret base on the remote ice planet of Hoth™, and Imperial ground forces are ready to attack! The Battle for Hoth™ has begun in an exciting game of strategy and luck for 2 or 4 players. Game play approximately 10-20 minutes. Prefer predare persoanala cu orice proba in Galati in magazin specializat, ocazional Braila, eventual pot expedia prin Posta Romana - Coletarie (10 lei transportul cu plata ramburs - ridicare de la oficiul postal corespunzator adresei dvs.) sau Livrare cu Verificare prin Curier Rapid Fan Courier sau Cargus (15 lei transportul cu livrare in 24 de ore, inclusiv Sambata), iar pentru plata online cu cardul sau in cont bancar deschis la Raiffeinsen / ING Bank va ofer Transportul Gratuit, multumesc si spor la cumparaturi! Pentru detalii va rog sa ma contactati la numarul de telefon 0736152486, multumesc!